First let me start by saying I love how fast I got these brushes! I ordered then August 26 and they were here on August 27. I used Amazon prime 2day free shipping. My case I received was a metallic green, the case itself obviously will not stay together forever and why should it, its made of cheap vinyl but anyway for 25 dollars you can't complain. The case has embossing on the lower right corner of the opening flap. It reads "Profound" my guess is that is the makers trademark. Opening the case you will notice it is held shut by two large silver magnetic snaps. The snaps are just punctured into the vinyl so once they come out they are gone for good. Each brush is held in place netting. The brushes that are sown in the first picture are not ALL the ones you will receive. 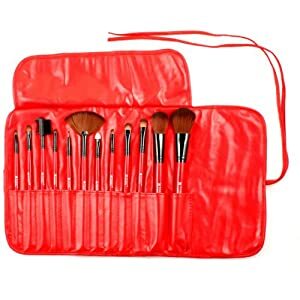 The brushes you should receive will be as follows: Two blush brushes, One large, one medium. A fan brush, A mascara brush, you should have one foundation brush (this will be the largest of the flat paint brush looking ones)you will have two concealer brushes that look almost identical, they are not, one is slightly longer and the brush is a bit wider then the other. you will have an angled brush that is best used for lining the top of the lids, a small lip brush, a brow comb/brush and an applicator. Each brush will come in plastic wrap to protect the brush. Four of the brushes will have a strong plastic "topper" keep the plastic that comes with the lip brush, fan brush and two blush brushes to help these keep their shape ladies. The bristles on these brushes appear to be glued in fairly well, again for 25 dollars you shouldn't complain you are not getting M.A.C. brushes nor are you getting Dior. So if you are going to complain then just do yourself a favor and don't buy the brushes. I will add my pictures of the case and each brush as soon as I find the connector to my digital camera. Then you can see what I think are more accurate photos of each brush..